Synthetic peptide conjugated to KLH derived from within residues 1 - 100 of Mouse MILI/ HILI. Our Abpromise guarantee covers the use of ab26408 in the following tested applications. WB Use a concentration of 1 µg/ml. Detects a band of approximately 100 kDa (predicted molecular weight: 110 kDa). Plays a central role during spermatogenesis by repressing transposable elements and prevent their mobilization, which is essential for the germline integrity. Plays an essential role in meiotic differentiation of spermatocytes, germ cell differentiation and in self-renewal of spermatogonial stem cells. Its presence in oocytes suggests that it may participate to similar functions during oogenesis in females. Acts via the piRNA metabolic process, which mediates the repression of transposable elements during meiosis by forming complexes composed of piRNAs and Piwi proteins and govern the methylation and subsequent repression of transposons. Directly binds piRNAs, a class of 24 to 30 nucleotide RNAs that are generated by a Dicer-independent mechanism and are primarily derived from transposons and other repeated sequence elements. Associates with primary piRNAs in the cytoplasm and is required for PIWIL4/MIWI2 nuclear localization and association with secondary piRNAs antisense. The piRNA process acts upstream of known mediators of DNA methylation. Participates to a piRNA amplification loop. Besides their function in transposable elements repression, piRNAs are probably involved in other processes during meiosis such as translation regulation. Indirectly modulate expression of genes such as PDGFRB, SLC2A1, ITGA6, GJA7, THY1, CD9 and STRA8. Inhibits tumor cell growth when repressed. When overexpressed, acts as an oncogene by inhibition of apoptosis and promotion of proliferation in tumors. Arginine methylation by PRMT5 is required for the interaction with Tudor domain-containing protein TDRD1 and subsequent localization to the meiotic nuage, also named P granule. Cytoplasm. Present in chromatoid body. Probable component of the meiotic nuage, also named P granule, a germ-cell-specific organelle required to repress transposon during meiosis. Immunocytochemistry/ Immunofluorescence - Anti-PIWIL2 antibody (ab26408)Image from Messina V et al., PLoS One. 2012;7(6):e39729. Epub 2012 Jun 22. 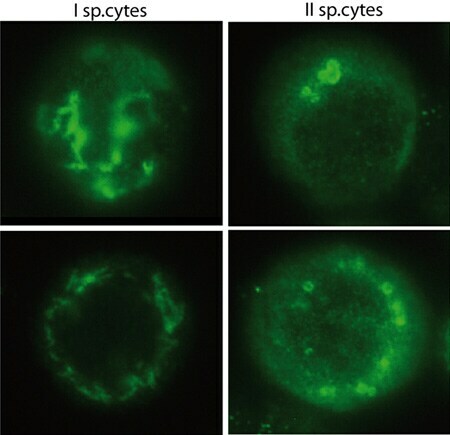 Fig 2.; doi:10.1371/journal.pone.0039729; June 22, 2012, PLoS ONE 7(6): e39729. Immunofluorescence analysis of late stage I and stage II mouse spermatids, staining PIWIL2, using ab26408 at 1/200 dilution. Cells were fixed in paraformaldehyde, permeabilized with 0.1% Triton X-100 and blocked for 1 hour in 0.5% BSA. Samples were incubated for 2 hours at room temperature with primary antibody and a FITC-conjugated anti-rabbit IgG was used as a secondary antibody. Publishing research using ab26408? Please let us know so that we can cite the reference in this datasheet. There are currently no Customer reviews or Questions for ab26408.